I grew up in a small town in southeast Kansas. The kind town where you didn't need to lock your doors at night. Kids stayed out late and played until well after dark in the summer. It was aTom Sawyer like existence for the most part. Life revolved around baseball, fishing, Cub Scouts, a good public education and church on Sundays. A bicycle and a few coins in your pocket gave you all the freedom you needed. 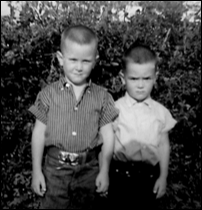 That's me at far left at about age 4 with my partner in crime, Tom Elliott. My grandfather Campbell, a man of many talents, was one of the first graduates of the Kansas School for the Deaf. Long before it was cool he and I text messaged but we never had a spoken conversation. Only later did I learn that I would share his interests in both woodworking and photography. As a young man, I walked a fine line between juvenile delinquency and the little boy who almost choked to death on his Sunday school collection money. Thanks to Mrs Abbuehl for saving my life and my nickel. My schooling was mostly uneventful and I lived up to my goals of a passing grade. That probably explains why my high school advisor, who shall remain nameless, would not allow me to enroll in the photography class. I guess in his eyes I looked like trouble. My work experience has been varied and valuable despite the fact that I didn't appreciate most of it at the time. I mention it now because I believe those jobs help me more fully appreciate all types of people. I'm as comfortable in the back room as I am in the boardroom. I've worked in a cabinetmaking factory, in a welding shop, a cement plant and feeding cattle in the dead of winter. If you have dreams of becoming a cowboy be forewarned, cattle like to eat everyday come hell or high water. I even spent part of one long, hot, summer literally digging ditches in Newton, Ks. That job did not pay enough. It took a while, but I came to discover that photography and a college education offered me a more varied and exciting existence. Fortunately, despite my lack of educational excellence, the University of Kansas was kind enough to admit me on probation. Eventually I was allowed to enroll in the prestigious William Allen White School of Journalism where I earned a Bachelor of Science in Journalism with an emphasis in Photojournalism. Professor Gary Mason and noted photojournalist and mentor to several great photographers, Rich Clarkson, led the department. If you didn't get a good foundation from the two of them you were either not paying attention or not trying. 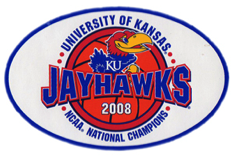 While at KU I worked for the student newspaper, the Sports Information Department and the School of Law. I also interned at the Kansas City, Mo. bureaus for the Associated Press with Pulitzer Prize winning photographer, John Paul Filo and at United Press International under the direction of Jose More. After graduation I worked as a staff photographer at daily newspapers in Kansas and in Walla Walla, Washington. Small town papers are a great place to start because you get do it all. Write, shoot, edit photographs and create assignments under deadline pressure on a daily basis. Walla Walla was known for two things at that time: the Walla Walla Sweet Onion and the Washington State Penitentiary. Both are interesting in their own way. I also met my future wife, a Vista volunteer from New York in Walla². Two years later Mt. St Helens blew her top and we decided to try life on the east coast for three to five years. With no clients and no money I started a freelance photography business in the Washington, D.C. metro area. Now, several years later, with a child and a mortgage I'm still here and still making photographs. From the beginning my goal was to develop long term relationships with an exclusive group of clients. That group includes organized labor, corporate clients and associations. Among them are: The American Federation of Teachers, Freddie Mac, the Renal Physicians Association, Verizon, Booz Allen & Hamilton, New York State United Teachers, the Freddie Mac Foundation and Scooter Abstracts. Others are Pace Harmon, the University of California Washington Center, US Pharmacopeia, Young & Associates, Rivermine Software and Entergy Corporation. My repeat clients and I have worked together for many years and I value those relationships more than they'll ever know. In the beginning my goal was to provide excellent photographs and no headachs. It still is and I still do.